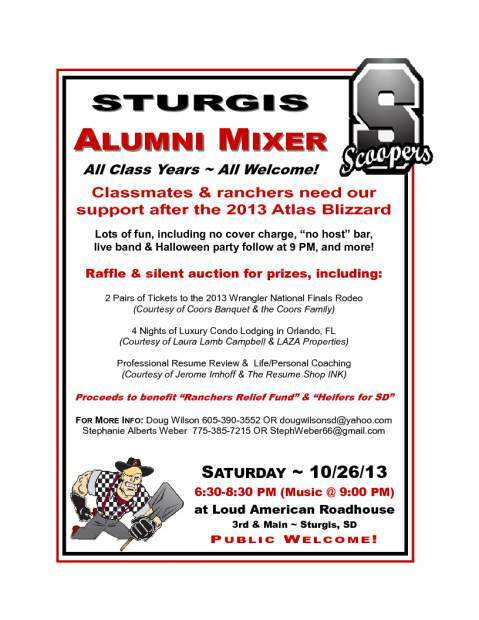 There’s a Sturgis Alumni Atlas Blizzard Relief Event at the Loud American Roadhouse in Sturgis this Saturday (10/26/13) from 6:30-8:30 p.m. Everyone is welcome, even if you aren’t a Sturgis alumni. We just want to help support the local ranching community and as many of our friends, classmates and neighbors as we can! 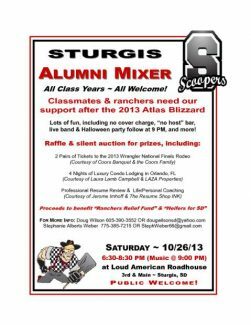 Alumni of Sturgis Brown High School & “old” St. Martins of ALL GRADUATING YEARS are invited to attend a mixer to lend post-blizzard moral support to our classmates in ranching & business. Raffle & silent auction for prizes including 2 pairs of tix to 2013 Wrangler National Finals Rodeo in Las Vegas (Courtesy of Coors Banquet & Coors Family! ); professional resume review & 1 hour of personal coaching (Courtesy of Jerome Imhoff & The Resume Shop INK! ); Gift Certificate for handmade truffles & toffees, shipped nationwide (Courtesy of Sheila Dale Poklemba & Sweetie Pie’s Candy); Western wear and accessories (Courtesy of Tim Harwood & Tony Lama Boots, Nocona Boots, Bailey Hats, Thorlo Socks, & TRU Fragrances), and more! Proceeds of the silent auction and raffle will be split between the Ranchers Relief Fund and Heifers for South Dakota, two excellent charities that have been established to help the ranching families that were so severely impacted by the storm earlier this month. The event format includes a “No Host” bar, no cover charge, and the kitchen will be open. This is intended to be a fun evening with a time to mix and socialize from 6:30PM to 8:30PM before the live band goes on at 9:00 PM (Thank you, Loud American Roadhouse & Homeslice Productions). Loud American is also having their annual Halloween party that night, so if anyone wants to make a night of it and wear a costume or dress up crazy-like, go right ahead! We hope that our ranching classmates especially will attend, so that we can give them a hearty handshake or a big hug in this difficult time. We will also have a computer available for anyone that wants to make an immediate donation to either of the charities.